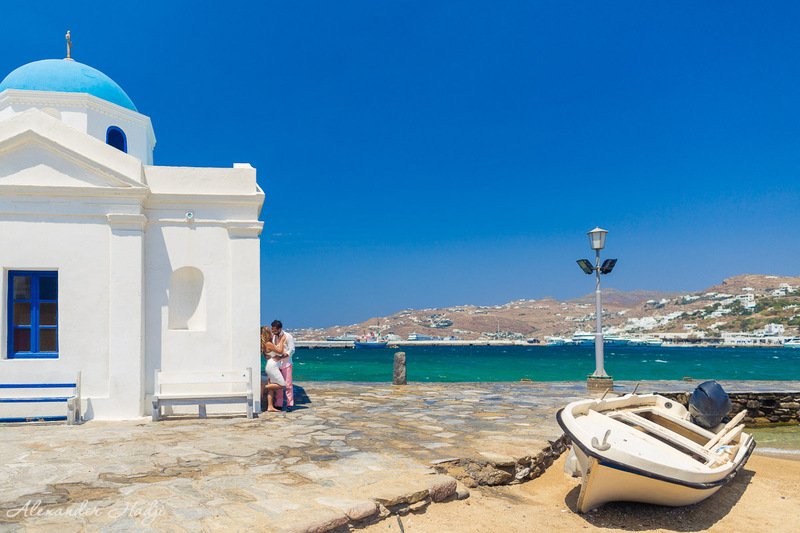 This Mykonos engagement photography was done for a lovely couple from the United States. The guys were absolutely in love and emotionally connected to each other. Another fascinating part was that my clients dared to fly all the way over the Atlantic Ocean from the United States to celebrate their engagement here, in Greece. So I knew, I absolutely had to make this day memorable for them. I love engagement photography. I adore those passionate glances, gentle touches and true emotions between the two in love. It helps me, as a photographer, to see and capture THE moment, which my lovely new clients will be happy to keep in their memories for many years ahead. 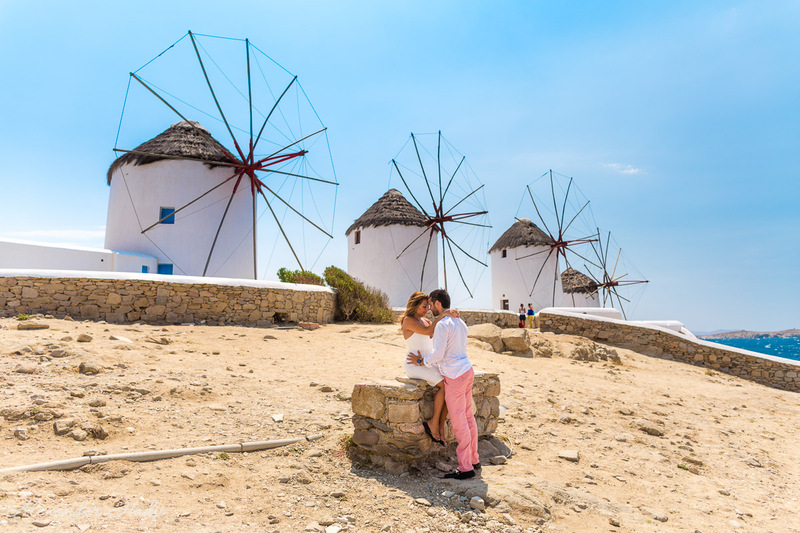 I was not surprised when the couple chose the most dynamic and at the same time bohemian place – Mykonos island. The famous island, loved by so many creative and artistic people, fully matched my new client’s exquisite and romantic character. We started out photo shoot walking along Mykonos town quay. Here all the magnificent scenery was at our disposal: tradition white houses with brightly coloured doors and windows of Little Venice and patios in Greek style only emphasised the beauty of newly engaged.Narrow streets and cafes of Little Venice that attract all possible kinds of people, from artists and painters, to famous movie stars became the next favourite setting.The sea, boasting all shades of blue from light aquamarine to the darkest shades of navy was the best scenery to lay stress on deep love and romance that my clients were sharing. 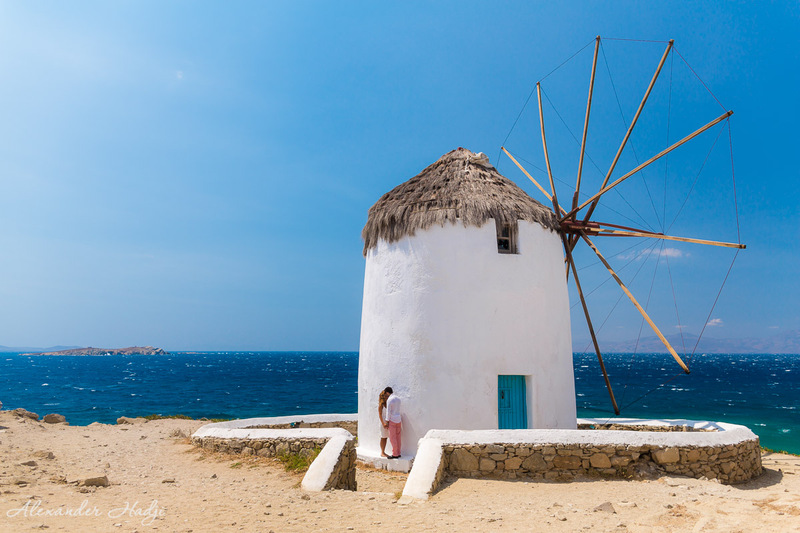 And of course, how couldn’t miss the iconic feature of Mykonos – the windmills? And the wind. It was a little windy, I should admit. The wind became our friend and enemy, helping and spoiling everything at the same time. It made the shoot even more interesting, filling it with happiness, joy and laughter. I enjoyed this photo shoot. Hope my clients did, too. 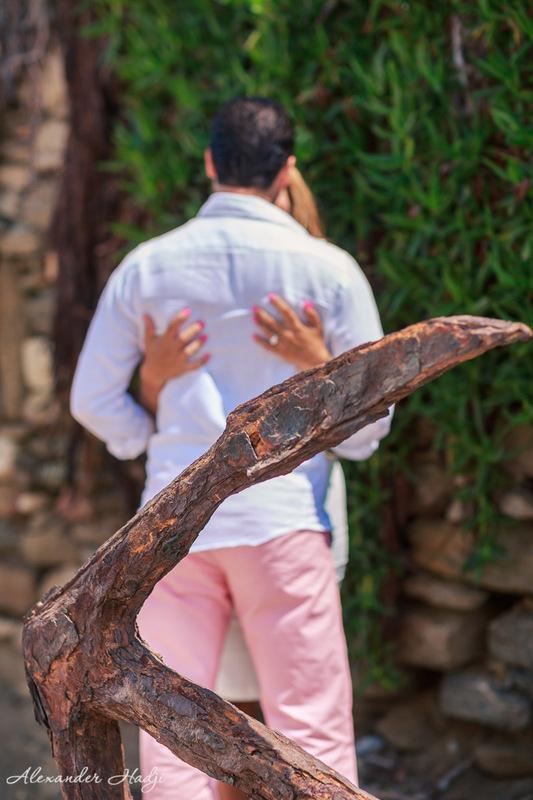 You might want to take a look at another romantic photo shoot done for a Russian couple in famous Santorini or at this honeymoon photography in the beautiful Corfu island, and here you can enjoy a stunning pre wedding photography in Rhodes. 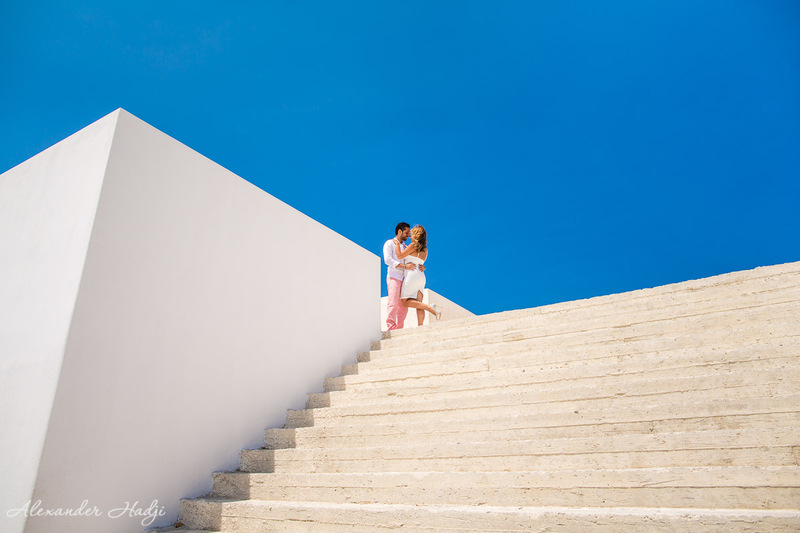 To book your Mykonos engagement photography by Alexander Hadji please email to info@hadjiphoto.com, make a call to +306951661016, send a message on FB or leave your contact details to get a call-back from the photographer. You can also use Viber or WatsApp. The photographer and his team answer within a day. I have sent an email with packages. As a newly engaged couple, we decided to hire a photographer for engagement pictures. Since we were planning our vacation to Greece in the summer of 2015, we thought it would be a great idea to have them done there. 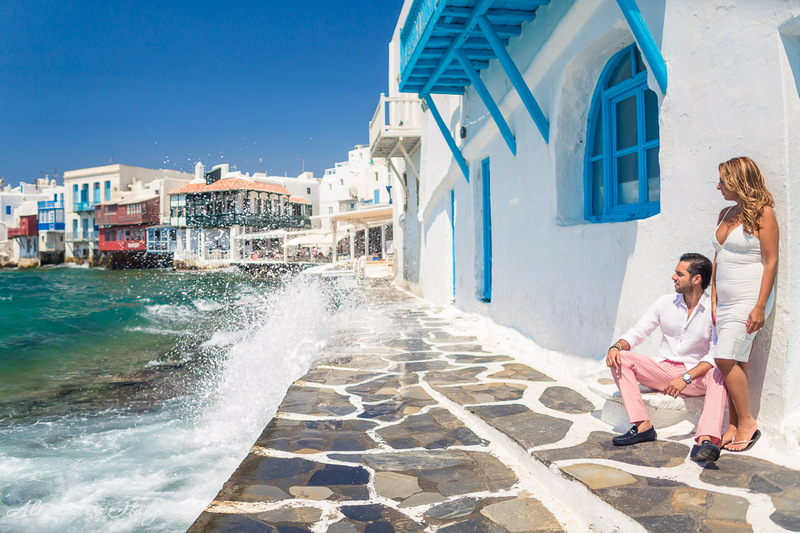 After reviewing our Greece itinerary, we decided that it would be best to have the photo shoot taken in the beautiful Greek island of Mykonos. We have been there several times before and we were familiar with the island’s beauty. Our next step was to find a highly skilled destination photographer familiar with the Greek islands with great reviews. Alexander Hadji’s website immediately drew our attention. His magnificent photos were so powerful and moving. We went ahead and contacted him via email. His responses were prompt and fluid. After explaining what we were interested in, he offered us various packages to choose from. After choosing, we forwarded to him a deposit via paypal to book the day. As we neared closer to the day of our photo shoot, we contacted Alexander via telephone for final instruction. He arrived to our hotel on time and we began. A vehicle was not necessary to get from place to place since everything was walking distance. He instructed us throughout the photo session and made us feel comfortable and confident. I highly recommend you bring a friend to hold any of your belongings (sunglasses, wallets, flip flops to heels, etc.) this way your pockets stayed empty during the shoot and your belongings are held safe without having to ask Alexander to hold these items while working. It was clear that Alexander had vision in photography which clearly resonates in his work. For example, as we began our informal walk from point A to point B, he would bluntly stop us and ask that we stand by a random: motorcycle, abandoned telephone booth, etc). It seemed a little bit strange and first but we were confident in his confidence and those photos most definitely paid off. 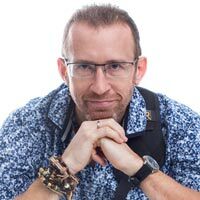 I do not want to go further into detail this way all prospective clients can experience Alexander’s work for themselves. We received the edited photos approximately 60 days after the photo shoot via email in high resolution and low resolution format. We chose five photos for photoshopping which were edited a week later. Alexander, the photos were breath taking! Apologies for this late review! It has been on our “to do” since we received these photos back in October! Compliments from all our friends and family! Your work was greatly appreciated and we will be giving you a call in the near future! thank you very much for a detailed review, it will definately help other couples to make their choice. It was a pleasure to work with you, looking forward to hearing from you in future. My husband and I are visiting Mykonos May 15 thri 18th for our 5 year anniversary and looking for a photographer to take vacation shots for us. Are you available and can you give me an estimate of time and costs? can we book for photos on that time? and can i know your prices ? My wifeand I are visiting Mykonos June 29th to 6th July for vacations. So we are looking for a photographer to take vacation shots for us. Are you available and can you give me an estimate of time and costs? I have sent the packages to the email provided.